It looks like Acer has got more to show off than its affordable tablets, the company also announced a brand new Liquid Z5 Android smartphone that packs mid-range specs under a 5” hood. Powered by a 1.3GHz dual-core MediaTek processor with 512MB of RAM, the Liquid Z5 has 4GB of expandable storage on board, 5MP rear camera, and runs on Android 4.2.2 out of the box. It may have a pretty large display but according to Acer, it is designed with an 8.8mm thin profile and rounded edge, making it thin and easy to carry around. The Liquid Z5 may be a mid-range Android smartphone with an affordable price tag, but it comes with the “best-in class snapper” with 5-element f2.4 lens, and 1.4um x 1.4um pixel size, allowing the 5MP camera to shoot sharper images even in low light conditions. It also has an IR filter that reflects infrared for more realistic photos. Other features include AcerFloat multitasking capability, AcerCloud and custom profiles. 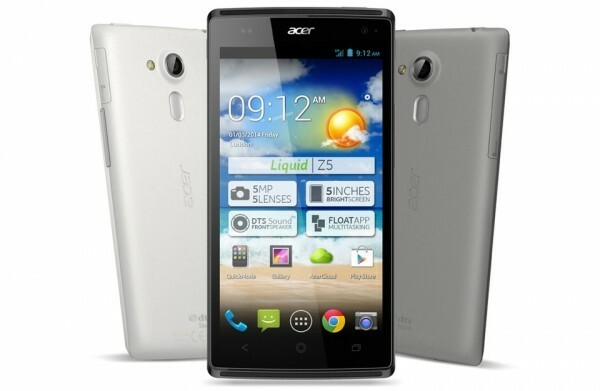 The Acer Liquid Z5 will be available in selected countries in Essential White and Gentle Grey for a retail price of €169 (approximately RM750).